For security reason one password is used for the enable password and the other will later be assigned to the console port. Set the exec-timeout period to 9 minutes or less to disconnect idle connections to the console line on each switch. Do not set the timeout period to zero because on Cisco switches that will disable the timeout. The following example sets the timeout period for the console line to 9 minutes and 0 seconds. The banner text is case sensitive. Make sure you do not add any spaces before or after the banner text. Use a delimiting character before and after the banner text to indicate where the text begins and ends. The delimiting character used in the example below is %, but you can use any character that is not used in the banner text. 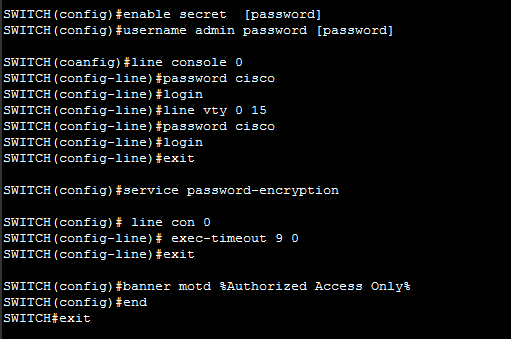 After you have configured the MOTD, log out of the switch to verify that the banner displays when you log back in.